Abstract: The analysis of real-world samples is becoming increasingly complex and time-consuming. Scientists frequently use techniques, such as chromatography to aid in the separation of differing compounds and components. Liquid Chromatography-Mass Spectrometry (LC-MS) has been the primary platform for determination of differing components when chromatographic co-elution was inevitable. Software can aid in simplifying the data-mining process and increase the speed of discovery. 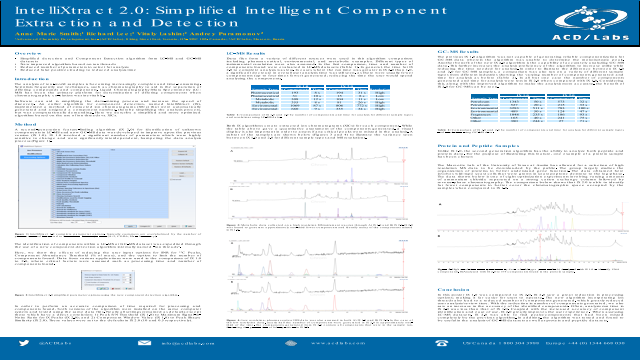 An earlier algorithm for component detection, named IntelliXtract (IX), implemented a method of extracted ion chromatograms (XICs) that were automatically generated and assigned a component number, thereby simplifying the analysis process, but was computationally demanding. Here we describe a simplified and more optimized algorithm based on the use of ion threads vs. XICs.